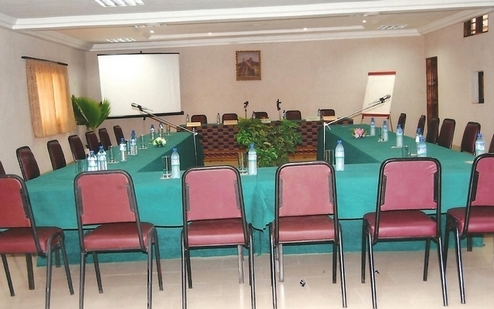 Nothing could be simpler than organizing professional, family or associative events in Lomé! The Memorial Hotel has a conference room in a beautiful and spacious modular space of 150 seats, bathed in natural light, to host your seminars, workshops, conferences and events of all kinds. The working space is conducive to good thinking, air-conditioned, and equipped to your convenience, with a secretariat, a covered terrace for your synthesis work and / or refreshing break, free WiFi internet access, a video projector, a flipchart with markers. Upon request, we can provide you with any audiovisual material. Plan your next conference, meeting, seminar or special event at the Memorial Hotel. Want to get a personalized offer for your meeting, seminar or event? Send us your request via the form opposite. Memorial Hotel strives to develop an environment that is a real source of inspiration for you to help you achieve and even surpass your goals.